First, it's time to announce the winner of the coconut marshmallow giveaway! Congratulations Patricia from Butteryum, your number was drawn by a very excited 7-year-old all hyped up on donuts and macaroni & cheese! With the exception of Friday pizza night, I haven’t cooked at all lately. I’m a total kitchen slacker in the summer, which is ironic considering this is the only time of year we get local fruits and vegetables. I did have an amazing long weekend though. Not big amazing, just the little beautiful life moment kind. Friday evening kicked off with one of my preferred pizza combinations. 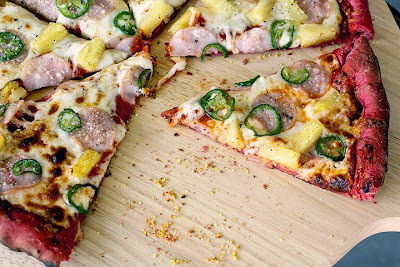 Canadian bacon with pineapple and paper thin fresh jalapenos are fantastic together. I know it looks a little weird (picture way down there), I was working on the beet crust recipe and that became my base. I finally have that crust perfected to my liking. It crisps up now like normal crust, and tastes pretty darn good! Saturday evening was magical. We spent the day in Lewiston, Idaho and Clarkst on, Washington playing around. We swam, shopped in the fresh market, found old cookbooks, grabbed a quick bite to eat, and headed out to a paved trail toward the southeast end of town. The path runs alongside fields of wheat to the North and a canyon to the South. 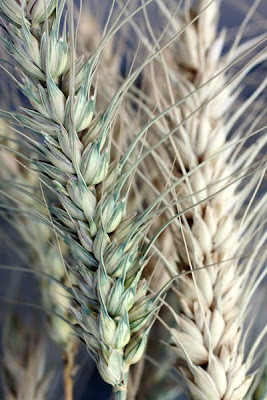 We were surrounded by warm summer air just starting to cool, and the sweet carbohydrate smell of freshly cut wheat. 10-year-old Quinn, daughter of our friend (Dishboy) Scott, began to glean the leftover wheat on the side of the field. She ran up to me with handfuls and insisted I pull off the chaff and eat wheat berries with her. So I did. They were crunchy and warm from the day’s sun. A new experience for me. The sun finished setting as we munched and crunched and walked. Suddenly, down the canyon coyotes began their nightly cries, I started to howl back and the kids joined in. For awhile we stood and howled with the coyotes. They would cry, and we would howl back. After awhile the coyotes grew tired of this and we headed back to the truck. Sunday we relaxed, played in the hot sun, and anticipated the next day’s raspberry picking. Monday arrived and we woke up to rain. Lots and lots of rain. We knew if we didn’t get up to Knapp’s Farm the raspberries would be gone though. So we put on warm clothes and headed north anyway. Attempting to stave off the cold, muddy, wet clothes we knew we’d have to deal with, we stopped for Vietnamese Pho. Then at last braved the wet fields. Or tried to rather! It was wet, and the early birds had taken much of the crop already. We still found a good selection, although I think half of my little box ended up in my belly. I just couldn’t help it; the raspberries were so fresh and sweet. I stood in the rain and picked and ate and picked and ate. 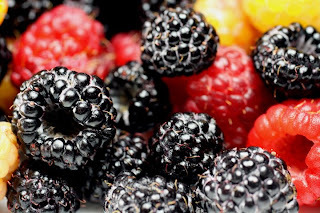 We collected white raspberries and black raspberries along with perfect plump and juicy red raspberries. Two hours is usually a long drive home when you’re completely soaking wet, but I was on such a happy raspberry picking high I hardly noticed. I look forward to the raspberry crème brulee I hope to make with them, but for now, I leave you with pizza. I never want summer to end. Enough almost warm water to make 1 cup when mixed with cooked beets, plus 1 Tablespoon. 1. Scrub beets under warm water to clean. Stab a knife into it a few times for venting. Line a plate with paper towels, place the beet on the plate, and cover with a paper towel. Microwave the beet on high for several minutes until easily stabbed through with the knife. Cool completely. 2. Chop the beet into chunks. Place 3/4 of a cup of the chunks (lightly packed) into a liquid measuring cup. Top with enough water to make 1 cup. Puree the beet/water mixture in a blender until smooth. (A couple small chunks are ok, but you might end up picking them out as you roll the dough. You can also strain beet mixture through a fine mesh strainer if you have one.) Pour the mixture back into the liquid measuring cup and top with enough water to make 1 cup, then add 1 more Tablespoon. 3. Add all the ingredients into a stand mixer bowl. Mix with the dough hook until well kneaded. 4. Remove from the bowl and knead by hand for 2 minutes on an unfloured surface. (If you have a counter that stains find another place). Then pat into a ball. 5. Grease a large bowl with olive oil and add the dough, flipping once to coat. Cover the bowl with plastic wrap and let rise in a warm spot until doubled. 6. Roll out ¾ of dough on a floured surface, do the final stretches by hand by gently pulling the ends with your fingers. Place on a lightly oiled and coarse cornmeal covered pizza pan, and then add the toppings. 1. Make the Zesty Old School Pizza Sauce in the link below or use any favorite red sauce. Measure out 1 cup of the sauce. Set aside. The extra sauce freezes well, or will cover another medium pizza. 3. Heat up the grill to hot and close the lid. 4. Brush the pizza pan lightly with olive oil and sprinkle with cornmeal. Stretch and roll ¾ of the dough and place on the pan. Brush with 1 Tablespoon olive oil. Spoon the pizza sauce around the dough. 5. Top pizza with the mozzarella, provolone, Canadian bacon, pineapple tidbits, jalapeño rings, dried parmesan, and a sprinkle of salt, pepper. 6. Set the pizza on the grill and close the lid. Turn grill to medium high and cook for 5 to 8 minutes or until cooked through. Turn to medium for a thicker crust pizza and cook longer. Remove onto a cookie sheet with tongs. 7. Wait a couple of minutes then cut into wedges and serve. 1. Adding more beet flesh to the dough will make a deeper purple crust. 4. Knapps Farm is in Greenbluff just north of Spokane Washington. Visit their website @ http://www.knappsongreenbluff.com/ for fruit picking information. You give your recipes such lovely names :-). I loved reading about your weekend. Take care, Laura. Wow - that beet crust looks wacky, but really interesting. Did it taste good? I'd like to try it with rocket and something else...(I don't eat meat on pizza)..anyway, it all looks great! Love the pics! 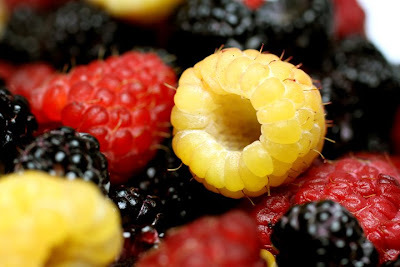 And yellow raspberries? Wow!! And a beet crust wow2! U are inventive ! WHat a beautiful pizza! SOunds great tasting too. Love the berry photos. I don't blame you for eating most of your raspberries along the way... I can't resist either! What a great pizza (awesome flavors -- and a great crust concept). Very unique... I'm thinking it would be a great way to use up those few stray beets in the fridge. Where did you ever come up with that idea?? The crust is great. I like it a lot. Also, I often make (or order) that pizza minus the pig plus onions. It's awesome that way! Yeah... I'm so thankful that your 7 yr old drew my name - please convey my appreciation! Your beet crust is intriguing, but I'll have to take your word on the pineapple pizza ;). I know hubby would like it... he worked at a pizza place during college; made many a strange pizza combos over the years, and ham/pineapple was one of his favorites! Wow, it seems that you are really busy!! that's great that you are enjoying a lot of time outdoors with your family. The berries look so fresh, of course they are! have lots of fun. I figured if beets could dye everything else red, they could make red dough. It works pretty well. Thank-you for the comment Recipe Man. One of my ongoing resolutions is to find ways to work beets into my diet. I don't really like them but know they're good for me. The only success so far has been with a very decadent Red Velvet Cake. This looks like a much healthier solution. I'l have to give it a try. I left you a note on your blog. SO fun to walk side by side with you over the course of your weekend. I felt like I was there! That made me really happy to read. Thank-you Ninette. Congratulations to the winner. That beet crust is so interesting and beautiful color. Amazing pizza! Whenever you make pizza it is beautiful, interesting and unusual. I love this post! So creative! We love making pizza & I'm always looking for unique recipes! That is one wild looking pizza! The pretty crust and the thinly sliced jalapenos both appeal to my sense of summer fun. I love your comments about the wheat and those raspberries are simply beautiful.